Light Showers is the debut collection of fine art from guitarist Frank Gambale. To craft the collection, Gambale worked with Los Angeles based art team SceneFour. 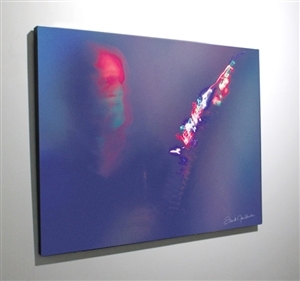 The Light Showers collection of artwork is part of a new medium that allows the guitar player to craft visuals through performance. The process of creation is an extensive one, but begins with Gambale utilizing a glove that lights upon impact on the guitar fret. Each finger becomes it's own "paint brush." As a result, Gambale is able to build the aesthetics seen in the collection when playing the instrument. The pieces that are created are abstract, vivid, and showcase his playing in unprecedented ways. Each of the works in the collection are available in highly limited edition sizes. All are numbered and individually signed by Frank Gambale and SceneFour. Each ship with Certificate of Authenticity.